Dreaming about summer on these cold winter days? Nothing beats a warm summer night grilling dinner for friends with a refreshing drink in hand. Ensure your outdoor living space is summer soiree-ready by starting your deck or patio refinishing project now, before deck season begins. Below, the professionals at Gantner Painting explain the importance of refinishing decks and patios. What Are Deck and Patio Refinishing? The processes of refinishing a patio and a deck are very different. While a wooden deck must be power washed, sanded, stripped and restained, the steps taken to refinish a patio vary. 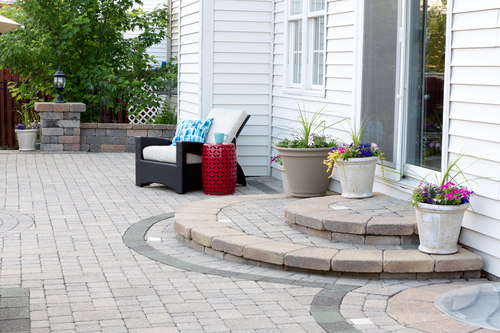 The way a patio is refinished depends on the materials used to originally pave the patio. Power-washing is always a good first step, due to dirt being ground into the crevices, nooks, and crannies over time. Whether your patio is made of concrete, brick, stone or cobbles, hiring a professional will ensure that the patio refinishing project is completed efficiently and correctly. Why Should I Refinish My Deck or Patio? If cracks or chips start to appear on your paved patio, it’s time to call in a professional to fix it. An expert can assess the damage and figure out the most cost-effective way to repair it, before more damage occurs. It’s important to keep up with the maintenance on wooden decks in order to preserve the sturdiness of the structure. If the wood is not cared for properly, it can dry out, making it easier to crack and splinter. While refinishing your deck on your own is likely to be easier than refinishing your patio yourself, hiring a professional will pay off in more ways than one. The experts you hire are equipped with the tools needed to properly do the job to deliver exceptional results in a timely manner. When you choose to work with a professional painting contractor, you are assured the project will be completed quickly, allowing you to enjoy a refinished deck as soon as the weather improves. If you’re considering a patio or deck refinishing project in the New Britain, Connecticut, area, give the friendly professionals at Gantner Painting a call at (860) 225-8577 to get a free estimate. For more information about their expert services, including interior and exterior painting, visit their website.